Art was born on September 7, 1922 in a house located where the motel lobby is now. Back then before the pool was added the land sloped away and Art built a small jump and unknowingly altered his life. By age 10 Art won his first award in the 14 and under class which is located in the lobby trophy case lower center. By age 17 Art earned a spot on the 1940 Olympic team. Back then Olympic teams were picked the year before. The `40 Olympics were to be in Japan. Unfortunately Japan was involved in WW2 and the games were not held. In 1944 there were no Olympics again because of the war. Art enlisted in the army air corp in 1943 and flew as a bombardier on B-24’s. He was discharged at the end of the war in 1946 with the rank Capitan. After his discharge Art went back to ski jumping. In 1947 he made the 1948 Olympic team. In late 1947 at a meet in the Midwest, Art out jumped the landing hill and punched through the soft snow at the bottom. The resulting fall damaged the ligaments and tendon in his right knee. Back then knees were not as well known as today and they put Art in a cast hoping things would heal. Art had a local doctor cut a hole in the knee of the cast and competed in the 1948 games. 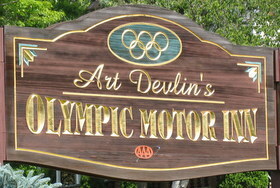 Art went on to compete in the 1952 – 1956 Olympics and made the team in 1959 for the 1960 Olympics. Due to his past injuries Art decided to give up his Olympic spot to the next in line. The 1960 games were the first to be covered by television and Art went along with CBS as a color commentator. In 1961 Rune Aldridge started ABC wide world of sports and Art was recruited as a commentator. Art did Ski jumping commentary for the next 20 years until ABC Wide World of sports ended in 1981. 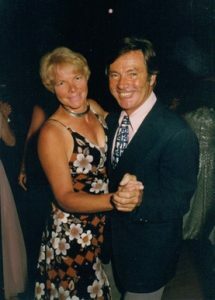 In 1950 Art met and married Helen McCutcheon and started the motel business and a family. They had three children: Jackie, Art, and Alexis. Art’s wife Helen died of breast cancer in 1989 and Frank Loving had a blue spruce panted in her memory on the front lawn near the registration area. Art remarried in 1998 to Dorothee Griessler and lived on the property until his death in 2004. In Art’s memory Wes and Debbie Moody planted a blue spruce for Art on the front lawn near Helen’s tree. Both Art and Helen’s favorite color was blue which is the reason both trees were blue spruces. During the winter both Art and Helen’s trees are lit with blue lights in their memory. Broadcast every World Ski Jumping Championship and Winter Olympic games since 1960 on TV, plus an average of 6 ski jumping events every winter on TV. Wide World of Sports ABC-TV Sports Commentator from 1962, for 21 years. 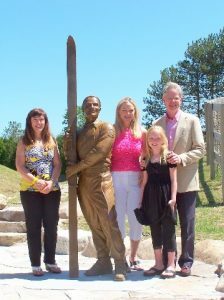 On June 13th 2008 a life-size bronze statue of Art was placed at the bottom of the 120-meter Ski Jump to honor Art’s life and accomplishments.